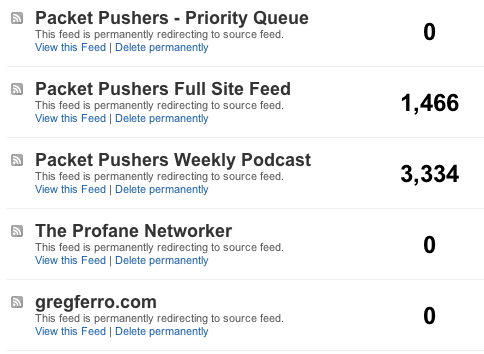 Last week I made the final change to quit Feedburner for all RSS feeds on PacketPushers.net and no longer have any active services. Its a relief to be free. When I first started blogging five and a half years ago, I was running a self hosted blog on a cheap plan from 1and1  and at about the six month stage started having performance problems. I was getting less 500 web hits per day. Turns out that 500 RSS users, and the web crawlers were generating significant load, even then. Upgrades to the 1and1 took many hours since I had to migrate servers. One way to reduce the load was to use FeedBurner so I signed up, installed the plugins and have been redirecting since. On Packet Pushers it doesn’t display the author name on the post in the RSS feed. I cannot work out why. As a multi-author site, this is a big deal. Feedburner show all the signs of abandonment by Google – primary evidence is when Adsense stopped working in Feedburner. No revenue means no future in the Google ecosystem. In my view, Google wants to create a walled garden in a similar style to Facebook and tools that support the Open Web are likely to be deprecated. 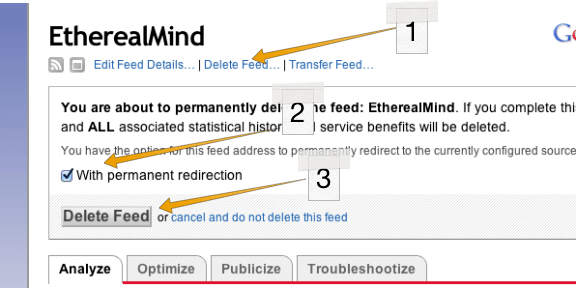 This is how to delete Feedburner in three easy steps. The redirection is really important. Most modern RSS Readers and podcast clients will notice the redirection and update the source URL for the feed. Thus you won’t lose your readers or listeners. Over the three or four weeks you will see the numbers of subscribers start to drop as the clients move to the new URL. In this image we have already seen about half of Packet Pushers Podcast subscribers switch over to the new URL in less than a week. When you first setup a WordPress install, all the advice is to use Feedburner. This advice is no longer relevant in 2013 and you certainly should not use it. Make sure that you install a caching plugin like W3 Total Cache and subscribe to CloudFlare (it’s free) to reduce load on your self hosted wordpress platform. Plus, I get a kick out of being part of the free web.